1. To make suitable by changing or adjusting; accommodate, assimilate, harmonize with, conform to: "The chameleon adapts to its surroundings by changing color." 2. To fit for a new use; transform, rework, convert, make suitable, modify, alter: "The drama was adapted from a short story." 3. To undergo modification so as to fit new circumstances or situations. 4. 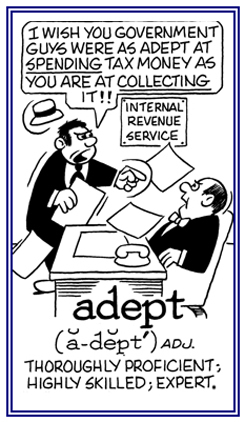 Etymology: from Latin adaptare, "to adjust" from ad-, "to" plus aptare, "to join" from aptus, "fitted". 1. To find the sum of numbers or quantities: "They tried to add the total number of people." 2. To say in addition; to go on to say or write more: "She said good-by and added that she had a pleasant vistit." 3. To join one thing to another so as to increase the number, quantity, or the importance of something: "They decided to add a new wing to the house." Used in medicine meaning to "add". 1. Things to be added or those things which are already added. 2. The plural form of addendum (used with a singular verb), a list of things to be added: "The addenda in the back of the book consists of fifteen pages. 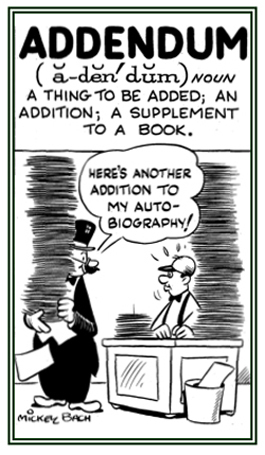 Something added or to be added; especially, a supplement to a book or magazine: An addendum may consist of a glossary or an alphabetical list of technical terms in some specialized field of knowledge which is usually published as an appendix to a text about that field. After a recent investigation, the editor added several addenda to the soon-to-be published article about plagiarism in the field of journalistic ethics. 1. Something added; mathematical summation: "Addition is usually taught before subtraction." 2. Adding, including, embracing; joining, annexing, appending: "The addition of a baby to the household changed our lives." 3. Increase, enlargement, extra, augmentation: "The addition in cost over last year’s tuition is $500." 4. Annex, wing, extension, adjunct: "The addition to the town library will double its size." A muscle that draws any limb, or part of the body, towards the trunk or main axis, or which folds or closes extended parts of the body. 1. Highly proficient or expert at something: Shirley is adept at organizational work in her community while her husband is adept in working with wood for shelves for their home. 2. Having or showing knowledge and skill and aptitude: Erin was adept in writing her column in the newspaper every day. 3. Etymology: from Latin adeptus, "attained, achieved". © ALL rights are reserved. 1. Sufficient for a specific requirement or barely sufficient or satisfactory. 2: Lawfully and reasonably sufficient. 1. Sufficient in quality or quantity to meet a need or to qualify for something; enough for the situation or need. 2. Just barely sufficient in quality or quantity to meet a need or to qualify for something. 3. In law, reasonably sufficient for starting legal action; such as, they had adequate grounds for suing the hospital for incompetence. 4. Etymology: from Latin adæquatus, "equalized"; past participle of adæquare, "equalize"; from ad-, "to" + æquare, "to make level", from æquus. A misspelling of agglutinate meaning to cause to adhere or to stick to, as with glue or causing red blood cells or bacteria to clump together. 1. Conveyed as being stuck together tightly to something as if by suction or with glue. 2. A reference to someone who sticks to an opinion, a practice, or a method. Showing page 6 out of 12 pages of 168 main-word entries or main-word-entry groups.